There’s a theory among startup investors that one good way for an entrepreneur to come up with an idea for a startup is to look at all the services big, successful, older companies provide and then build a company around doing just one of them. In a talk given at Y Combinator’s startup school, Andreessen Horowitz partner Chris Dixon called this “un-bundling.” He talked about how the big newspapers of the 1990s provided three services. They created content. The published classified ads. And they curated content (through page layout, etc). Now there are several big companies doing just those those services. The Huffington Post creates news content. Craigslist publishes classified ads. Twitter curates news. 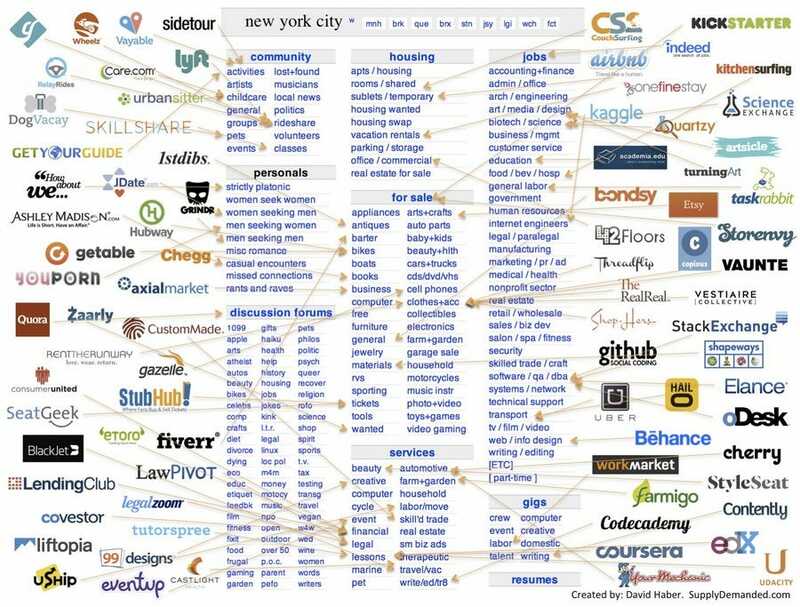 One of Spark’s former analysts, David Haber, made this cool chart showing how all the various services of Craigslist are now being done by individual startups. So which big companies are getting disaggregated next? Lots of startups think the answer is the Apple iOS ecosystem. For a few years there, you probably got all your digital music and movies from iTunes. Now you probably listen to Spotify and watch Netflix. And instead of storing photos on your iPhone, maybe you keep them on Dropbox. Alexander Pease, an analyst at Union Square Ventures, has another cool idea: Banks. He points to startups like Dwolla, which helps merchants accept payments and avoid credit card fees. There’s also Wonga, which provide payday loans and Primarq which does home equity loans. Over on Pease’s blog, he’s made a chart, modelled after the Craiglist one above. Click on it for a larger image.